When Jerry Falwell and Pat Robertson blamed God and America for the attacks on 9/11, it only proved how silly they really are. This was aired only 48 hours after the attacks on New York and Washington. 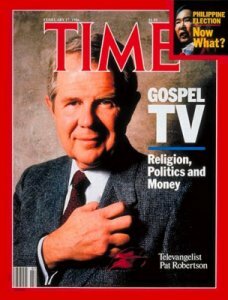 Ralph Reed already bailed out of the Christian Coalition, Pat Robertson finally resigned in December 2001. Pat's failure to get Early elected as governor of Virginia and the shambles of the Gilmore Governorship (Pat claims "some credit" for his election) may have marked the end of Robertson in VA and national politics. In 2005 Pat Robertson is going more silly than ever, and some are claiming his influence is declining. Is it perhaps the Christian Right in general, that drives the Liberal Left into hysteria, really isn't as powerful as we think? The Christian Coalition is a shell of its former self, Jerry Falwell's Moral Majority is gone, and the Republican Party is as disunited as the Democratic Party. The reality is Pat Robertson's irrationality and paranoia is often shared by his Leftist-Liberal rivals. It seems that Pat Robertson and the Religious Right, like the irreligious Left, are given more credit than they deserve. Pat has never held public office and the Religious Right in general has gotten very little of their core agenda into law. I also think the mostly Liberal press singles Robertson out to discredit Christianity in general. Even here in a conservative Republican state like Virginia and Pat Robertson's home base, most don't identify with his agenda. Many of Pat Robertson's "Christian" beliefs have nothing to do with the Bible or Christian anything. If we are to believe the teachings of Jesus, the Christian Right often runs counter to it. They alienate many moderate and liberal Christians. These Pat Robertson types worship an abstract idol in Paul's Gnostic Christ, not the Jesus of the Galilee. Pat Robertson is clearly a racist and anti-Semitic bigot. He and other Bible-thumpers may support Israel, they do not support Jews or Judaism. To these folks Israel is part of some second-coming of Christ prophecy, despite the fact the Bible proves this failed in the First Century. Pat Robertson is another conspiracy theorist. Pat Robertson often uses terms such as "New World Order" or "New York bankers" etc. often codewords for Jews or the Freemasons. But if Pat Robertson is a conspiracy theorist, so is the Liberal Left. I tracked the hysteria of the Religious Right during the Clinton years of the 1990s, today the Left is equally hysterical with Bush. What is new, however, is the infiltration of anti-Semitic references. To quote "these media people speaking in their own code language. A case in point is their use of the term 'neoconservative.' Whether they choose to hyphenate the label or not, it's a pejorative code word for 'Jews.' (They) are just trying to support Israel at the USA's expense. This is total nonsense. See Questions on Christian Anti-Semitism by Lewis Loflin. Pat, God help you soul because of a statement you are making under the name of religion. You are not God and who are you to say that anyone should be assassinated. You men or women in the name of religion who make such statements are not of God. I am a child of God and I know that you opinion should be trying to lead people to God not putting hate in their heart. I watched the clip on this myself and wondered what all the fuss is about. Pat spoke as a citizen in regards to this mess in Iraq. The press should stop promoting this man to something he is not. Racists such as Jesse Jackson and Al Sharpton can say anything they want attacking whites and Jews, the press is silent. Looking for anything to attack Christians or conservatives in general, the liberal press blows it out of proportion. ...he's going to make that a launching pad for communist infiltration and Muslim extremism all over the continent. You know, I don't know about this doctrine of assassination, but if he thinks we're trying to assassinate him, I think that we really ought to go ahead and do it. It's a whole lot cheaper than starting a war. And I don't think any oil shipments will stop. But this man is a terrific danger and the United ... This is in our sphere of influence, so we can't let this happen. On the January 5, 2006, 0n The 700 Club Robertson said that Sharon's illness was possibly retribution from God for his recent drive to give more land to the Palestinians. He also claimed former prime minister Yitzhak Rabin's 1995 assassination may have occurred for the same reason. Both Evangelicals and the ADL went nuts. The White House called Robertson's statement "wholly inappropriate and offensive". Robertson was also chastised by Israeli officials and members of the Anti-Defamation League and on January 11, Israel responded by announcing that Robertson would be banned from involvement in a project to build a Christian tourist attraction and pilgrimage site near the Sea of Galilee known as the Christian Heritage Center. Pat on January 12 sent a letter to Sharon's son Omri, apologizing for his comments. He said, "concern for the future safety of your nation led me to make remarks which I can now view in retrospect as inappropriate and insensitive in light of a national grief experienced because of your father's illness...I ask your forgiveness and the forgiveness of the people of Israel." Omri and the Israeli government accepted the apology. Ref. Wiki. When it comes to exposing anti-Semitism, the ADL is highly selective. While the right is a frequent target, the Left (including Islam) often gets a pass. Minister Louis Farrakhan, fuhrer of the Nation of Islam, is the most influential anti-Semite in America. He makes David Duke look like a member of Hadassah. In October, Farrakhan is having a reprise of his Million Moron March. In a May interview with the Amsterdam News, former President Bill Clinton endorsed the rally (describing it as a "very positive idea"). The ADL decided to simply ignore this aid and comfort to a notorious hate-monger by an ex-president. Its leadership would never countenance criticism of a man beloved of the Jewish establishment. I believe Feder is correct as we shall see. Federal judges are a more serious threat to America than Al Qaeda and the Sept. 11 terrorists, the Rev. Pat Robertson claimed yesterday. "Over 100 years, I think the gradual erosion of the consensus that's held our country together is probably more serious than a few bearded terrorists who fly into buildings," Robertson said on ABC's "This Week with George Stephanopoulos." "I think we have controlled Al Qaeda," the 700 Club host said, but warned of "erosion at home" and said judges were creating a "tyranny of oligarchy." Confronted by Stephanopoulos on his claims that an out-of-control liberal judiciary is the worst threat America has faced in 400 years - worse than Nazi Germany, Japan and the Civil War - Robertson didn't back down. "Yes, I really believe that," he said. "I think they are destroying the fabric that holds our nation together." Robertson's comments came with a showdown looming in the Senate over seven of President Bush's conservative judicial nominees who have been blocked by Democrat filibusters. Republicans have threatened a "nuclear option" to pass the judges by rewriting Senate rules to stop the filibusters. Sources told the Daily News that Senate Majority Leader Bill Frist lacks the 50 votes he needs, which could be a blow to his presidential hopes. "I don't think Frist has the votes," a GOP aide said. "He's now in his own corner. If he doesn't have the votes, he's really screwed." Robertson echoed that sentiment. "I just don't see him as a future President," Robertson said."